Best Eats expert panelist chef Ian Kittichai calls unassuming Maru his top pick for "very good custom sushi." 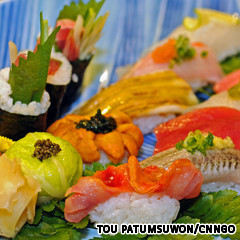 Chef McDang agrees, noting that while there are many great Japanese restaurants in Bangkok, "this one is very personal. Nice and quiet, tucked away, very friendly." "It's all done traditionally with Japanese style, as the owner is Japanese," says McDang. "He knows that I like things that are unusual and that I have to have an education in the culinary arts of the Japanese culture. 'What do you have, why do you use these ingredients?' He will educate you." Located in the Japanese enclave of Thong Lor, where Japanese restaurants outnumber Thai restaurants, the 12-year-old Maru is where Japanese executives dine without worrying about the cost. "So bloody expensive I have to go dutch,” laughs McDang. "But it's worth it; really fresh and inventive. Everything about eating Japanese at Maru is an experience. My palate gets to taste very different things every time I go." Provence Cafe, inside Bangkok's Peninsula Plaza, has a huge menu of satisfying pasta, seafood and meat dishes. 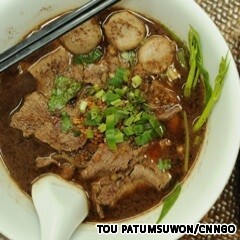 But it's the Thai noodle dishes that get local foodies salivating. "Great Shanghai has bland décor and dicey service, but the duck is pure bliss," says Bangkok 101 publisher and Best Eats dining expert Mason Florence. "Succulent meat and crispy skin." The staff take great pains to make sure there isn't a spot of fat left on the skin when it hits your plate, expertly de-fatting it at your table. Accompanying the duck slices are thin, non-sticky but soft and moist pancakes and what just might be Thailand's best Peking duck sauce -- homemade hoisin with the perfect balance of sweetness and saltiness. The huge restaurant features authentic Cantonese cuisine, but the Peking duck is what everyone comes for. 648 Sukhumvit Road soi 24, BTS: Phrompong. Tel: +66 (0)2 258-7042. Open daily for lunch 11 a.m.-2 p.m. and dinner 6-10 p.m. It took a while for the concept of Sunday buffet brunch to catch on in Bangkok, simply because “Thais eat mini meals," says Chef McDang. "Brunch is a very Western concept. "But caught on it has, with the Four Seasons edging out some stiff competition to top our list of Best Brunches. As business owner and Best Eats judge Suki points out, the table service and pure selection gives it the advantage.You don't have to line up and wait for the chefs to prepare your dishes. Simply leave a card with your table number on it and they'll bring it to you when it's ready.Just be sure to pace yourself. The granddaddy of Bangkok brunches, the Four Seasons lays out dozens of serving tables that groan beneath the weight of fresh Sydney rock oysters, lobster, Indian, pasta, Middle Eastern kebabs, lamb chops, steak, veal, roast duck, cheeses, sushi and caviar.And because Sunday calories don't count, the dessert table includes tiramisu and peach creme brulee. Even for a five-star hotel, this brunch is extravagant.Wash it all down with champagne or mimosas and your Sunday afternoon just got a whole lot more interesting. "Som Tam Nua has got the art of papaya salad nailed, in more varieties than one can imagine. 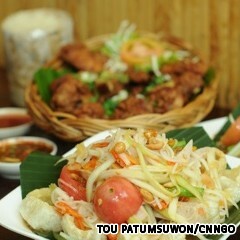 Be prepared to queue up for a table," says Thai 101 publisher Mason Florence. In business for almost a decade, Som Tam Nua has never lost it charm nor its popularity. With modern décor, the place is always packed full during peak hours. It is more of an eat-and-run place rather than a chill out spot, serving flavorful Isaan dishes including the popular phad kanomjeen (stir-fried rice noodles) and fried chicken. 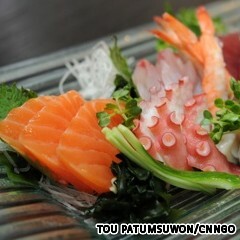 392/14 Soi Siam Square 5, Rama 1 Road. Tel +66 (0) 22 51 4880. Open daily, 10:45 a.m.-9.30 p.m.